Ruth Maystead has painted enchanting, vibrant portraits of dogs, cats, & horses for over 30 years. Her unique style and ability to capture the essence of the animal as well as faultless anatomy makes her artwork popular with both collectors and animal lovers worldwide. These beautifully designed items from her original artwork, gives everyone the opportunity to enjoy her designs. ROLLER PENS- These roller pens are our #1 product. They are very smooth writing and come in 64 stunning Ruth Maystead designs, including dogs, horses, cats & birds. We have refills available. The pens are very fast sellers, priced right, and have a high profit margin. They fit by your register in very attractive displays & customers love them. LISTPADS & MAGNETS- Our #2 product, these lovely listpads have a full color print of your pet, are approximately 8 ½ inches by 3 ½ inches, contain 50 pages, are lined, and have a magnet on the back. The separate magnet on the front is in full color and unbreakable. This combo moves quickly, is ideally suited for resorts, and is attractively priced for quick turnover. We have several racks to display these alone or in combo with other products. PLAYING CARDS- These gorgeous playing cards feature the stunning designs of Ruth Maystead, are now available in 64 designs, handle beautifully, are high quality and made in the USA. They are our #3 product and moving fast. The box is in full color, they are poker sized (regular sized), and are shrink wrapped. 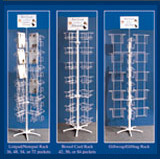 We have free racks with a minimum purchase for display. PRINTS- These stunning photographic prints are beautiful full color renditions of Paintings by Ruth Maystead. They are attractively mounted in a double beveled mat and are signed and numbered by Ruth. The image size is approximately 8" X 10" and the outside dimension of the mat is 11" X 14" which is a standard frame size. WALLETS- This new product features 12 new beautifully designed dog breeds by Ruth Maystead. A real winner, the wallet is 4 1/4 inches by 7 1/4 inches, will hold a check book, has plenty of room for credit cards, etc., is made of naugahyde & polyester fabric, and has been very well received. It promises to be one of our top sellers and is a wonderful gift. NIGHTLIGHTS- These nightlights feature the stunning artwork of Ruth Maystead in full color. The nightlight contains a 2 1/2" x 3 1/2" image, is UL approved and runs only on USA current. LISTPADS- As described above, these listpads are sold without the individual magnet. These are also a fast mover and provide a good price point. GIFTPAKS-This is a three piece version of the above products. It has an added notepad which is approximately 8 ½ inches by 5 ½ inches, with 50 pages, and a full color design at the top. The notepad, listpad, and magnet combo makes a great product for resorts or the web and we can add a roller pen to the package for you. These are all great gifts for the pet lover and in great demand. MAGNETS-Our full color magnets feature the beautiful paintings of Ruth Maystead in over 150 designs. They are unbreakable, have a great price point , and are available in some of the rare breeds. This is a great under $5 item. We also have a small spinner rack available for displaying. GIFTBAGS- Our gorgeous giftbags feature a collage of beautiful designs by Ruth Maystead. They are available in 2 sizes: the large bag is 11”high x 9”wide x 4”deep, the small bag is 8.5”high x 6” wide x 4”deep. There are 32 designs available: 30 dog breeds, 1 cat, and 1 horse design. The bags have a shiny patent finish, contain a gift card, and are made of heavy duty paper; a beautiful way to present your gift..
GIFTWRAP- This stunning giftwrap features a collage of beautiful designs by Ruth Maystead in the same designs as the the giftbags above. Each pack contains 2 sheets of wrap (19 ¾ “ x 27 ½ “) and 2 gift cards. Add a bow and you have a gorgeously wrapped package. NOTEPADS- the notepads are a larger version of the listpad minus the lines and measures approximately 8 ½ “x 5 ½ “ with 50 pages. These are very attractive memo pads or great for jotting phone numbers. They are sold alone, with a magnet, or in our 3-piece giftpaks. CHRISTMAS CARDS- These charming cards feature special Christmas paintings by Ruth Maystead including her very popular breed “choirs”. Remember your best friends by sending them one of these lovely cards. They are sold in boxes of 6 or paks of 4 and are the same size and price as the boxed cards. The greeting on the inside is: “Wishing you a Joyous Holiday Season, and A Happy, Healthy New Year”. MEN’S SILK NECKTIES- These very special silk neckties are available in 9 breeds and multiple colors. Wear your favorite breed as a fashion statement. They come beautifully boxed in an acrylic box ready for gift-giving. WOVEN TOTES, PILLOWS, and PLACEMATS-These beautifully designed woven products are available in 8 breeds and are woven in polyester (machine washable & dryable, delicate cycle). The pillows have zippers for ease of washing, and all totes but the Wheaten and the Beardie have zippers and are lined. Copyright 2007 © Best Friends by Ruth Maystead All Rights Reserve.